I got on board my Air Canada flight to Paris on the afternoon of Tuesday September 10th. A quick flight to Vancouver, then a plane change for a direct flight to Paris on a Boeing 767. As I boarded the 767, I became the recipient of two strikes of good fortune. The first was that I received a seat in Business Class instead of Economy as my ticket indicated. The second was that I was seated next to a cute single French girl named Christine, an employee of Air Canada in Vancouver who was off to visit family in Grenoble. The flight arrived in Paris in about 8 hours, but with the time change, it was about noon on Wednesday. For the next day and a half while I got over jet lag, we stayed with Philippe's parents and sister Claudine who lives nearby. They are very friendly and hospitable people who made my stay there most enjoyable. We did a little sightseeing. The first order of business was to visit something that I had missed in my two previous visits to Paris, Jim Morrison's grave. 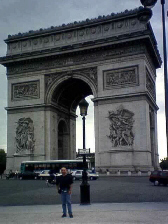 We also visited my favorite French landmark, the Arch du Triumph. On Friday, we took off for Chamonix.